rarecardinvestments has no other items for sale. 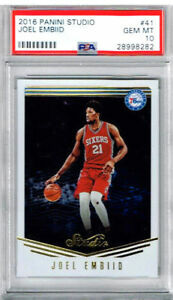 2018-19 Panini Prizm All Day SILVER Prizm #1 Joel Embiid PSA MINT 9 POP 1! JOEL EMBIID 2014-15 Panini Select ROOKIE ORANGE PRIZM Rookie #54/60 PACK FRESH!! $0.75 shipping for each additional eligible item you buy from rarecardinvestments.